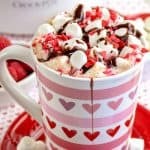 This homemade Chocolate Raspberry Hot Cocoa is sweet, delicious and festively decorated for Valentine’s Day, you’ll love warming up with cup after cup. Add the milk or half and half cream to a 1.5-quart slow cooker. Stir in the vanilla extract and powdered sugar. Add the raspberry preserves to a microwave safe bowl and microwave on HIGH for 20 seconds. Remove from microwave and stir into the milk. Add the cocoa powder and whisk to combine. Heat the cocoa on HIGH setting for 1 1/2 to 2 hours, stirring every 30 minutes. If you are not serving right away, reduce the setting to WARM or LOW until ready to serve. Before serving, pour the chocolate raspberry hot cocoa into your serving glasses. Add a generous topping of whipped cream. Sprinkle with mini marshmallows and valentine sprinkles. Drizzle chocolate sauce on top and add a few fresh raspberries.